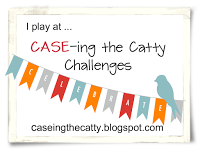 H2 Designs: CASE-ing the Catty - A Second Attempt, this time with brayered tissue paper! 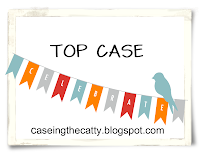 CASE-ing the Catty - A Second Attempt, this time with brayered tissue paper! You can never have too many thank you cards, so I made this little notecard, inspired by the spotty bag on Page 148. The card is all SU, except for the flower petals, which are made from generic tissue paper that I had in my wrapping paper supplies. I have brayered a piece with Coastal Cabana at one end & Bermuda Bay at the other end. Then I layered the almost dry (Bermuda Bay inked) brayer over a section of Coastal Cabana to get a nice in-between colour. I have used 4 different sized scallop punches, with one layer of each colour (so 12 layers in total). I added a gold brad in the centre & scrunched up each layer individually & then unfurled them to create the bloom. & my "oopsie" entry here. Luckily I am quite comfortable with having a good laugh at myself because I also discovered that the Yippee-Skippee MDS download that I thought wasn't available HAS been available for over 12 months! :o The upside of that is I can now do the wall art I was hoping to. :) Yay!